Kayvon Asemani, W’18, chose a triple concentration in management, marketing, and finance to develop the business chops he needs to run his eponymous music and clothing company. Aspiring hip-hop artist and entrepreneur Kayvon Asemani, W’18, has performed sold-out shows on Penn’s campus, but he captivated his largest audience at the United Nations headquarters in New York City this summer. The Baltimore native performed three original songs for a crowd of 1,400 people from 193 countries as part of the International Young Leaders Assembly in August. “To see leaders representing countless nations from all over the world coming together and becoming unified around my message, that was something special,” Kayvon said. Just a few days before the assembly, Kayvon spoke about uniting people through music on an entrepreneurship panel for the Penn Diplomacy and Policy Council, organized by Wharton and Engineering junior Robert Patrick Dowling, W’18. His message captured the attention of one of the audience members: John Dickson, the chairman of the Global Young Leaders Academy. 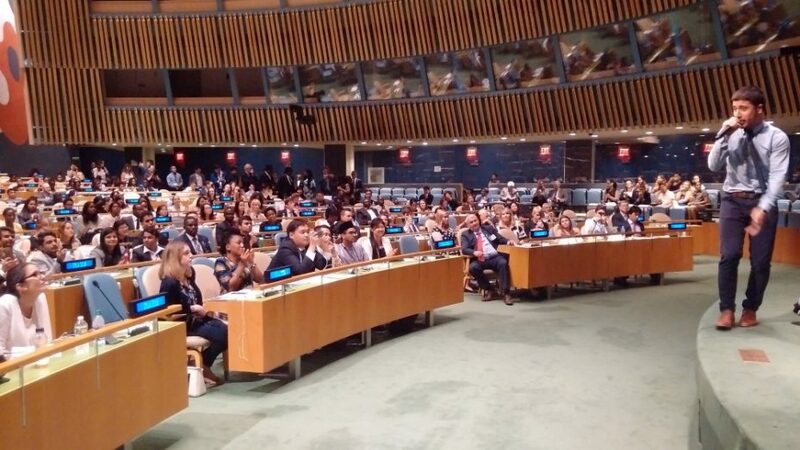 “Two days later, I got the call from Robert saying someone in the crowd at the entrepreneurship panel was putting the program together for the UN that week and wanted me to do a performance for the call to action,” Kayvon said. The performance and media attention surrounding it gave Kayvon’s music career another stamp of legitimacy. In addition to meeting world leaders, he also got to meet Grammy Award-winning producers Jimmy Jam and Terry Lewis, who took the stage before him. The experience has undoubtedly helped Kayvon expand the reach of his music, which is what brought him to Wharton in the first place. “It may seem counterintuitive, but it makes a lot of sense to me,” he said. A junior economics major, Kayvon has been putting his classroom learning to work in real time. He chose a triple concentration in management, marketing, and finance to develop the business chops he needs to run Kayvon Enterprises, the eponymous music and clothing company he launched in 2015. Compared to his qualitative strengths in speaking, writing, and presenting, Kayvon felt his quantitative skills could use a lot of work — and Wharton’s heavily focused quant curriculum was just the challenge he needed. He’s learned the importance of data and has become better at analyzing it. Making an impact is a core part of Kayvon’s brand identity — his clothing line is all free-trade, he teaches finance skills to students in West Philly as part of the Financial Literacy Community Project, and he’s currently working on an impact investing project to address some larger social issues. It’s also a key part of his identity as a campus leader in the Wharton community. Over the past three years, he has served on the Wharton Council, Civic Scholars Program, Turner Social Impact Society, the board of the Black Wharton Undergraduate Association, and his cohort leadership board. At 9 years old, Kayvon lost his parents to a tragic domestic violence incident. A close family friend helped him and his two siblings get into the Milton Hershey School in Pennsylvania, a tuition-free boarding school established by the chocolatier to help underprivileged children. Kayvon thrived there. He cultivated his gift for music, playing the trombone in two school bands, and discovered his passion for leadership, giving speeches to state politicians, launching a student-run school news website, chairing committees that raised thousands of dollars for charity, serving as president of the student body, and graduating as valedictorian of his class. He set his sights on Wharton at the age of 14 and became the first Milton Hershey student to gain admission since 1977. Angela Duckworth, the Christopher H. Browne Distinguished Professor of Psychology at Penn, met Kayvon when he was a senior at Hershey and highlighted his journey of overcoming adversity in her book Grit: The Power of Passion and Perseverance. One of the others he has gotten to know is Adam Grant, Class of 1965 Wharton Professor of Management. The story of how they met is a bit serendipitous. The close family friend who helped Kayvon get into Milton Hershey happens to be a huge fan of Prof. Grant. During one of his visits to Penn, he and Kayvon went on a search to find Prof. Grant’s office. “Adam and I had never met prior to this moment,” Kayvon said. “As if it was meant to be, Adam just appeared in front of us before we even left Huntsman Hall to look for him in his office.” They made quick introductions and Kayvon emailed Prof. Grant that night. Kayvon is a mentor now himself, extending advice to other students as they applied to college. His two mentees were just accepted into Wharton last week. It was “an incredible moment” for Kayvon.